Pat the fish dry with a paper towel; season lightly with salt, if desired, and pepper. In a large frying pan over medium-high heat, warm 2 to 3 tablespoons oil until hot but not smoking. Stir in the mirepoix, season with salt, if desired, and pepper, and cook until starting to soften, 1 to 2 minutes. Stir in the broccoli and garlic and cook until the broccoli is starting to soften, 1 to 2 minutes. Add the beans, 2 tablespoons [¼ cup] white wine (from your pantry), if using, and 1 cup [1½ cups] water and bring to a boil. Reduce to a simmer, add the olives and fish, and cook, turning the fish once, until cooked through, 2 to 3 minutes per side for cod, 3 to 5 minutes per side for halibut, and 1 to 2 minutes per side for trout. Remove from the heat, stir in 1 tablespoon [2 TBL] lemon juice, and season to taste with salt, if desired, and pepper. Transfer the fish and vegetables to individual plates. Garnish with the lemon zest and as much Marash chile as you like and serve. Measure the water for poaching. 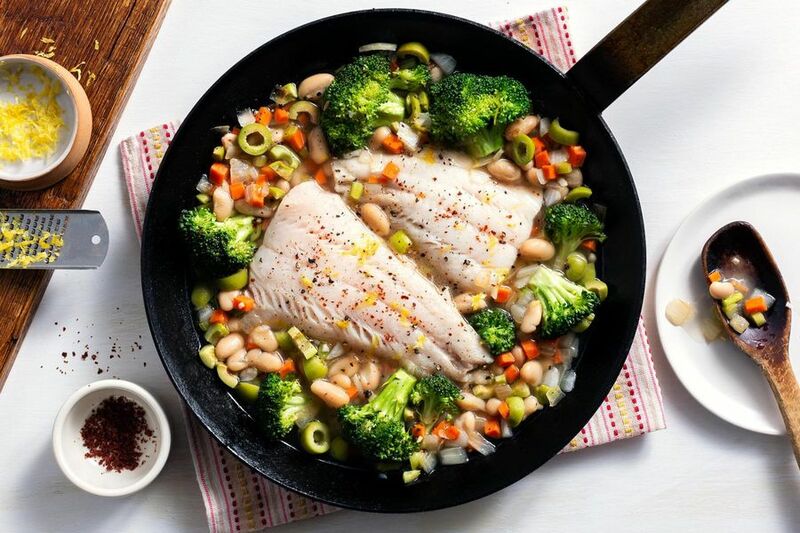 Easy and quick, poached cod fillets with broccoli, white beans, and a splash of lemon juice (cooked all in one pan!) burst with bright Mediterranean flavor. The Heart-Check Certification indicates the recipe meets the American Heart Association®’s nutrition requirements. To remain at or under the maximum 600mg sodium per serving, avoid using salt to season this recipe. We also recommend using the lower amounts of oil suggested for preparation. Use just 1 tablespoon [2 TBL] oil in Step 2 to cook the vegetables and fish to shave off 60 calories and 7 grams of fat per serving. Marash chile flakes hail from southeastern Turkey and are close cousins of Aleppo chile flakes from nearby Syria. Both types are floral, fragrant, and mild—rather like ordinary red chile flakes on steroids. We love to sprinkle them onto Mediterranean dishes like this one to give them a mild kick. Calories: 440, Protein: 40g (80% DV), Fiber: 10g (40% DV), Total Fat: 18g (28% DV), Monounsaturated Fat: 11g, Polyunsaturated Fat: 1.5g, Saturated Fat: 2g (10% DV), Cholesterol: 80mg (27% DV), Sodium: 530mg (22% DV), Carbohydrates: 33g (11% DV), Total Sugars: 7g, Added Sugars: 0g (0% DV).